Julie Morgenstern is an organizing and productivity consultant, New York Times bestselling author, and speaker. For over 25 years, Julie has been teaching people all around the world and at all stages of life how to overcome disorganization to achieve their goals. Her mission is to free each individual to make their unique contribution to the world—by helping them design their own systems for managing time and space that feel natural and are easy to maintain. This Inside Out approach to organizing everything gives readers, listeners, and clients the energy and knowledge they need to get (and stay) organized. In her newest book, Time to Parent, Julie helps parents find a healthy balance between raising a human and being a human. She provides remarkably practical strategies that contain and clarify the seemingly infinite job of parenting into a manageable road map that works from cradle to college. Her unique framework shows you how to harness your own strengths and weaknesses to make the job your own. Time to Parent teaches you how to manage the conflicting priorities of the parenting years while still creating plenty of quality time with your kids and for yourself. As a speaker, workshop leader, media personality, and corporate spokesperson, Julie Morgenstern is known for her passionate, articulate style and warm sense of humor. She has written columns for O Magazine, Redbook, and Wells Fargo, helping readers solve problems by inspiring order in their lives. She has shared her expertise on countless TV and radio outlets, including The Oprah Winfrey Show, CNN, The Rachael Ray Show, The Today Show, Good Morning America, and The National Public Radio. She is quoted and featured regularly in a wide variety of publications and has been seen in The New York Times, Time Magazine, USA Today, Business Week, The Wall Street Journal, Best Life, O Magazine, Martha Stewart Living, Glamour, Cosmopolitan, Fitness Magazine and Men’s Health. Julie is as crisp and engaging in her books as in person. She helps readers diagnose the causes of their disorganization, make mindset changes through insightful metaphors, and master simple technical skills they may be lacking. In addition to Time to Parent, Julie Morgenstern is the author of the classic tomes Organizing from the Inside Out and Time Management from the Inside Out. Julie and her daughter, Jessi Morgenstern-Colon, co-authored Organizing from the Inside Out for Teens. Her workplace productivity and work-life balance tome, Never Check Email in the Morning, is now the basis of a popular training program conducted for Fortune 500 businesses and organizations worldwide. Julie’s book Shed Your Stuff, Change Your Life takes her message to a new level, showing people how to use the process of decluttering to ‘get unstuck’ in their lives. Time to Parent: Organizing Your Life to Bring Out the Best in Your Child and You It can feel impossible to find a healthy balance between raising a human and being a human. 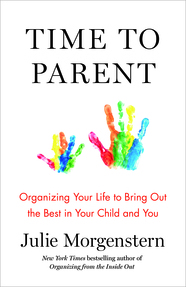 But Julie Morgenstern offers parents remarkably practical strategies that organize the seemingly infinite job of being a parent into a manageable set of responsibilities that are relevant from cradle to college. Her clear, nonjudgmental approach will help you see what you’re doing well, where you could be doing better and how even small changes in your own behavior can yield big results. Based on her forthcoming book, Time to Parent, this presentation will empower you to juggle the priorities of the parenting years, as you create regular quality time with your kids--and for yourself. Making Work, Work: Practical Keys to Productivity In this talk, Julie helps audiences improve workplace performance and productivity from the Inside Out. She shares how to prioritize, concentrate in distracting environments, and outsmart interruptions, providing concrete ways to nurture professional and personal life. Time Leadership: Creating a Culture of Productivity In this thought-provoking presentation, Julie helps management see the role they play in creating a culture of productivity. By thoughtfully developing norms around email, meetings, quiet time, interruptions and time off, good time leadership enables organizations to meet their goals—such as recruiting and retaining top talent or staying ahead of the competition. Organizing from the Inside Out Julie's approach to organizing is deeply human and uniquely effective. She teaches listeners how to design a system that sticks based on their unique personality, needs and style. Audiences learn how to to organize a home that helps them recharge and a workspace that reduces stress and facilitates productivity. The Great Juggling Act: Creating Balance Based on her best-selling book Time Management from the Inside Out, Julie empowers audiences to change their relationship with time and work with their natural style instead of against it. Listeners learn how to plan, prioritize, and stay in balance. SHED: Decluttering Your Space, Time and Habits to Get Unstuck Using her proprietary SHED formula, Julie guides audiences through letting go of the obsolete in their spaces, schedules and behavior to make room for new experiences and growth. This talk is perfect for groups experiencing transition to be empowered to move forward as their most authentic, fully-engaged selves. "Julie has a brilliant way of making sense of all that we've learned in our Parent Ed events over the years. We are a stronger and smarter group of parents thanks to Julie's insights!" "Her organizational tips and strategies are top-notch--I am confident audience members will be able to apply her principles, even to their highly classified information." "Julie’s presentation strongly contributed to the conference’s success, and I feel fortunate that I was able to sit in on her session!" "Julie was the highlight of our conference. I’ve been unable to walk the length of the hall outside my office without someone stopping me to recite tips from her presentation."